Friday Night Out; The last Friday of each month - this will be a great opportunity for us to simply be neighbors to those around us, no gimmicks, no hassles, just dinner in the company of friends. 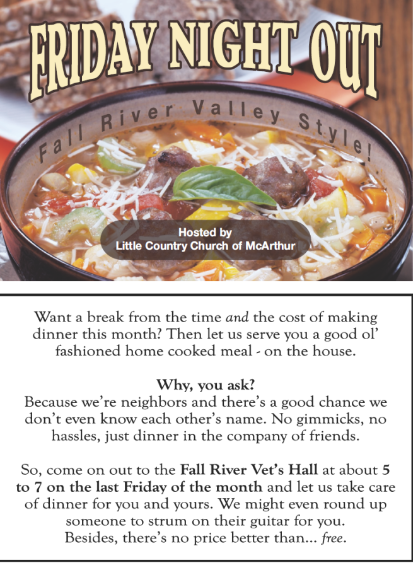 The church will be providing a hot meal for All those that come we will be cooking something that fits in a crockpot, an example would be, soup, stew, chili, or truly anything that would be yummy and you can bring in a crockpot, also bread and a simple dessert. If you can help with any of these items please call Pete or Susie at 336-7226.